We are very much concerned each day with the speed of our internet, For this reason many of us always want to know and be sure our subscribed bandwidth is given to us so we always want to check our broadband internet speed. Don’t worry, I have made this post for you to show you how to check your internet speed from online absolutely free and fastest way. I will be revealing to you some top website links from which your broadband internet speed can be checked and then confirmed so easily. Also you will also learn how to check bandwidth usage continuously with windows operating system’s utility and a third party software utility. In this simple tutorial. Whenever you experiences slow page opening and DNS resolution taking time in your network I will refer you to these Top 4 Websites to Check Internet Speed Online. For I advice that it will be better to check your internet bandwidth to make sure that you have got your committed bandwidth from your ISP or not. So, if you want to check your internet bandwidth speed, below I have listed Four websites for you to look out for. Bandwidth Place which can be used from Desktop, Laptop, Mobile and Tablets is a HTML5 based and lightweight free internet speed test suite. I always use this site to check my broadband bandwidth when I face any confusion. So, if you want to measure your broadband internet speed with Bandwidth Place, go to Bandwidth Place by click the link and check your internet speed just clicking Start button within speedometer. As soon as you click Start button, it will start pinging and show the download and the upload speed in right panel. 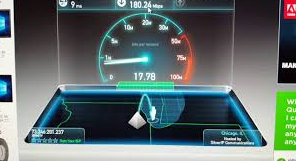 Charter Communications has a lightweight and free internet speed test utility. But adobe flash player must be installed before using this utility. So, if you have adobe flash player installed in your PC, go to Charter Communications from this link and check internet speed just by clicking Begin Test button. As soon as you click the button, your broadband internet speed will be started measuring and you can see your download and upload speed as a summery after completing measurement. Armstrong also provides a free internet speed testing tool where internet speed can be checked so easily.If you want to check your internet speed with Armstrong tool, go to Armstrong site by clicking this link and then click on Begin Test button. You will see your broadband internet upload and download speed as a summery window within a few seconds. WOWWAY is also an awesome free and faster internet speed testing tool. Your internet speed details can be found accurately by clicking just a button. Go to WOWWAY webpage by clicking this link and then click Begin Test button. Within a few second you will find your download and upload speed details as a summery window. Speedtest.net is also an awesome free and faster internet speed testing tool. Your internet speed details can be found accurately by clicking just a button. Go to speedtest webpage by clicking this link and then click Begin Test button. Within a few second you will find your download and upload speed details as a summery window. With the above website you can check your internet speed just one time. But you can also check your broadband internet speed continuously. I am showing here two techniques by which you can check your current internet speed continuously. By Windows Task Manager: Internet speed can be checked continuously from Task Manager in windows operating system. So, if you are a windows user, you can check your current internet speed from task manager. For this, go to Task Manager and click on Performance tab and then choose Wi-Fi or Ethernet by which your internet is connected. If you are windows 7 user, click on Resource Monitor button and then click Network tab. Now your live bandwidth usage can be observed from this window. By DU Meter: It is an third party software tool that can be used to check live internet speed from your Windows Desktop. So, if you want to monitor your bandwidth continuously with DU Meter, Download DU Meter from this link and install it in your computer. A Download and Upload Speed Panel will be appeared on your Desktop to observe live internet speed. This tutorial shows you all you need to check your internet speed for free. ← Amazon Lunches an Efficient Android browser Known As Internet. Is this really working on your side? I was unable to check speed test until I visit another. If you follow my tutorial above properly…. each and every word I said in this tutorial works ! and they are test tools i use each day.